Drona is a 2008 Indian Superhero film starring Abhishek Bachchan, Priyanka Chopra, Kay Kay Menon and Jaya Bachchan. Drona has been described as a Harry Potter meets Prince of Persia movie, but with an original story. Drona's special effects shots were worked on by EyeQube headed by Charles Darby and David Bush. The movie features Indian martial arts such as: Kalaripayat, Chhau, Gatka, and sword fighting. It was filmed in Prague, Bikaner, Maharashtra, Rajasthan, and Namibia. 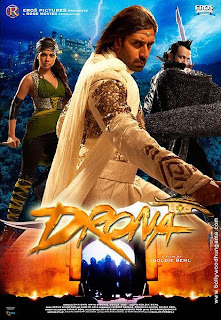 Drona released worldwide on October 2, 2008.